You’ve finally decided to go for it and start a VA biz. You’ve done your homework. Figured out what services you want to offer and in what niche. You’ve picked a a WordPress theme for your site and/or hired someone to help. And now you just need the world to know you’re open for business. Hooray! I’m toasting you from afar because you’ve got most of the hard stuff done. Simply put, Search Engine Optimization (SEO) helps you show up in search engines like Google. By using the right keywords throughout your website and in your blog posts, you increase your rankings with Google and helping the people who need your work find you. Good SEO on your VA blog or website will help clients in your niche need to find you in order to buy your services! And the limits of SEO? Though I do think some simple SEO tools, tips, and tricks can help people in your industry or niche find your website, there are many times new clients will come via word of mouth or as a result of your other marketing methods. This is why I don’t sweat being Number One in the search engines. But, I do want my content to show up and be found by the right people, of course! The first step to having your VA website show up in search engines like Google is to find out what key words and phrases your clients might be searching for a virtual assistant to hire. This will take a little bit of research. 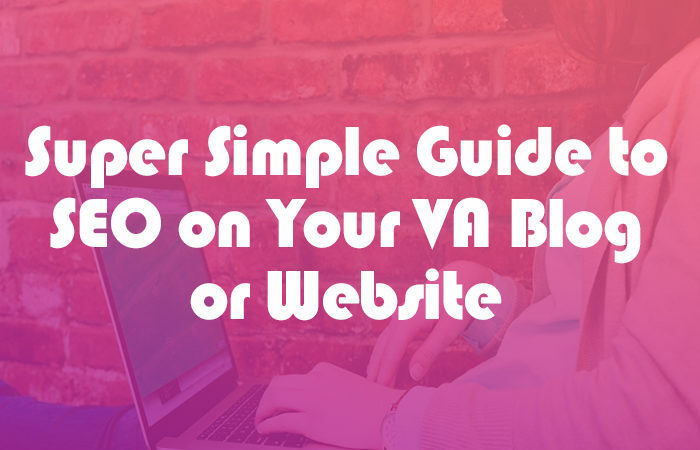 Here a some tools to help your SEO on your VA blog. Try signing up for a free Google Adwords account (find that right here), which will give you access to the Google Keywords planner. They will make you give them a credit card to join, but they will not charge you just to use the Keywords planner. Another option for some simple keyword research is just to do a search in Google (for your niche + virtual assistant) and see what comes up! Google usually offers some suggestions for what to search for next that can be great to use for your research. I love to use Pinterest as a keyword research tool as well, especially for blog posts. Just search in Pinterest for your niche and take a look at what comes up. This can give you some great suggestions or ideas about what people in your industry are searching for so you can either incorporate those phrases into your current posts (if applicable) or use it to get content ideas that will help increase your SEO and traffic. Once you’ve got a list of your keywords and phrases, you’ll want to add them into your copy and a few other places in your website. Blog post or website page title – Whenever possible, try to include one of your keywords into the title of your blog posts since this will improve your SEO rankings. Body of post – Also, you’ll want to include your keywords throughout your blog posts in a natural way. Alt Tags – One great little trick is to add your keywords in the “alt tags” space when adding an image as this does increase your SEO. DO NOT OVER DO THIS! – Stuffing all your keywords in a post is actually BAD for SEO and decrease your rankings in search engines. YOAST – If you’re using WordPress as your platform, adding a plugin like YOAST is a wonderful way to manage your SEO within blog posts and pages. This plugin will give each of your posts an SEO grade. You’ll either get a red, yellow, or green light plus suggestions on how to improve the post and get a green light. 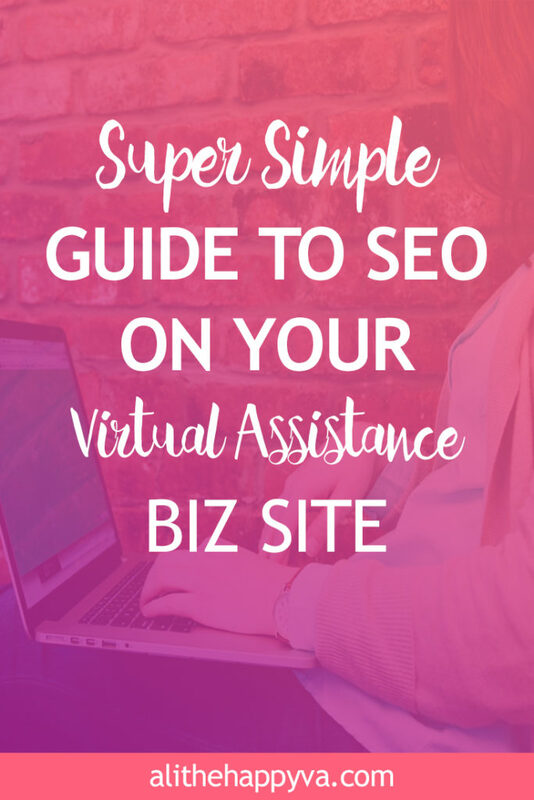 Though internet searches are not the only way clients will find you, I still think it’s worth it to make sure you’ve got some SEO in place on your VA blog or website. What do you think? Is SEO a waste of time if you can’t be Number One? And if it’s worth it, what simple tricks am I missing? I’d love to hear about it in the comments.